In just under two weeks, my husband and I will be celebrating our first wedding anniversary. Time flies when you're nerdy in love. 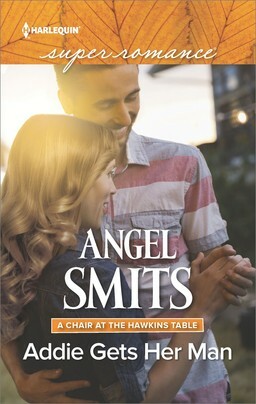 John and I met while we worked together in the magazine section at an Indigo Bookstore. I asked him out after about a year of getting to know him. We went steady almost instantly, and I introduced him to my parents within a week. Our wedding day was gorgeous, with the most perfect weather, and everything (from my perspective) went off without a hitch. 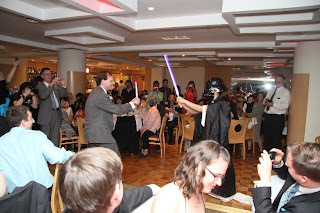 I had it all—friends, family, surprise Stormtroopers (my older sister’s gift to me), and a lightsaber duel with the newly minted hubby. After all, a wedding's not complete without sci-fi violence. I imagine John and I will look back fondly upon that day for the rest of our lives. But deep down, I worry those memories will fade, or that life will get in the way of celebrating this event or other milestones. It’s already happened on a personal level: the older I get, the less birthdays mean. Each year just adds another wrinkle, another gray hair, until I realize I am subtracting more than I am adding to my life. Riding this melancholy train of thought, I realized people celebrate sad events annually, too—it’s hard not watch the news without learning it’s the anniversary of some tragic event. Often, those headlines are marked with lingering questions, sadness, resentment and anger. People gather to remember what happened that day with heavy hearts, bearing tragedy with the same stoic pride one would a battle scar. Whatever the occasion, the passage of another year seems to warrant some kind of fete, and the size and scale of that celebration is often in direct correlation to the depth of emotion experienced that day. It seems to be the reason why tragedy gets so much more attention. Not to say that such events don’t deserve fanfare: Never Forget applies to so many things: war, shootings, disasters…the what, why and how or tragedy are the building blocks of history. Such maudlin thoughts make a girl flanked by Stormtroopers feel a little sheepish about celebrating something as trivial as the most expensive party in your life. It’s almost…crass. After all, what does my wedding day mean next to all the other things that happened in history on that same day? And we did it with a healthy dose of awesome. Then I realized something: An anniversary is just one day out of 365. There are still 364 more days to account for. And so every day, I tell my husband how much I love him, how much he means to me. There are days we’re too busy for even the briefest of conversations, but we always touch, always hug and kiss to let the other know we’re there for each other. Through good and bad, we are each other’s constants. We’ve pledged to be together for the rest of our lives. And we’ll celebrate it not just on one awesome day, but every day. For John: May we cherish many more days, months and years. Happy anniversary, my love. 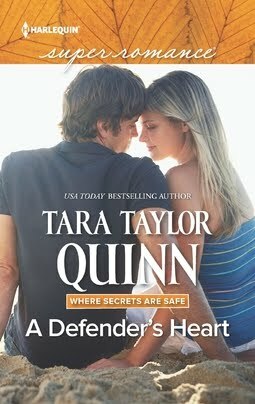 Her Son's Hero will be released July 2011 from Harlequin Superromance. we are going to make 25 yrs this year and we still hold hands, touch, hug and tell each other I love you all the time! Our wedding was in a catholic church where we all gathered around the alter (guests too). My dad and his mom were our witnesses. We got married in jeans. The priest told us our's was the first wedding he had on more white than the bride (I had none)! Then we had a big party at the beach for all of our friends and family! Happy Anniversary Vicki and John. May you have many more...And never lose the sense of fun you had at your wedding. Happy Anniversary Vicki and John. What you said is so true and uplifting. Not a day goes by that I don't let my hubby of almost 8 years know how much I love him. It sounds wonderful. I especially like how your wedding reflected who you are. Happy Anniversary!! Awww...Vicki. That made me tear up. Wow, I loved it. From the wedding to the way he reminded you why this day is so important. My heart feels all full for y'all. Oh, and I love the stormtroopers. You're sister rocks! In a little over a week, my husband and I will celebrate our 17th. Still can't believe we've been together that long. And as to having things fade - good marriages are like antiques. Time nicks and dings them, but the quality of the piece pared with the gentle care given it makes it enduring and more lovely with the passage of time. You may forget some details of the first year of marriage, but you'll never forget the feelings...and that's what's most important. Congrats, Snookie, on 25 years! Quite an accomplishment. 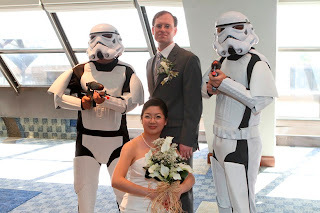 I saw the picture of the bride groom and stormtroopers and decided I definately have to meet you in person someday. I've often said over the last 18 years that the one thing I would have done differently at our wedding would be to play the Star Wars theme song for the recessional instead of the highly traditional song we chose. You know, the part where Luke, Han and Chewbacca got thier medals at the end of the first movie. Congratulations on your anniversary. You will definately remeber. Every time I attend a wedding with my husband, we renew our vows by holding hands. We still touch, dance, hold hands even if we haven't figured out what to do for our anniversary this Sunday. What a sweet post, Vicki. Congrats on your first anniversary. 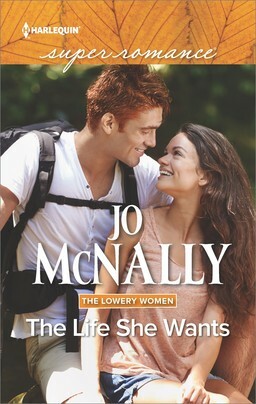 Talk about happily ever after in real life! Vicki, Congratulations on your 1st Anniversary. Delightful, Vicki. Love the storm troopers and love how you made that day your own. Oh, dear, I've been watching too much American Idol. Happy Anniversary Vicki and John! May the force always be with you! My personal belief is that celebrations of the tiny things in life are just as important as celebrations of the largest things because it's the small things of which life is made. I may not be able to save the world, but if I can make a difference for one person or a few people, then I've accomplished something worth celebrating. If that person or persons go on to touch someone else, then the effect continues. Love is always worthy of a celebration. I was amused that the pronouncement of your marriage was a bit different. My wedding began differently, with the officiant saying, "Now you can put away your computers!" You see, my husband and I met on CompuServe about 26 years ago (married 23 years) when he lived 500 miles away in Kansas City. I have to agree with you, too, on celebrating every day together! Happy 1st Anniversary, Vicki. Thanks for the great blog. Congratulations! Your wedding sounded just awesome. May you have many more geeky anniversaries in the years to come! Thanks, everyone! I hope my marriage is as long and happy as some of yours. Vicky, I'm a newlywed, too. Have been for 30+ years. Congrats to both of you and may the force be with you. Happy anniversary and many many more to come! Live long and prosper. Congratulations on your first anniversary. Paper... Hmm... I bought my dh a delicate silk screen on tissue paper Japanese fish mobile. It still hangs over his desk... Not the most expensive thing we own but it is what he would save first in a fire (after us and the dog). Thank you everyone! Paper anniversary...yeah, I don't know what to get the hubby that's paper related. 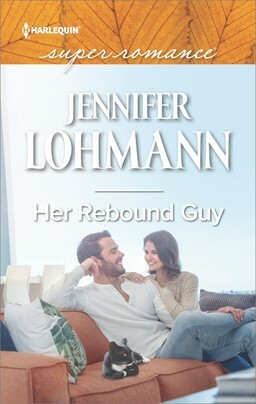 Does an ebook count? Hope you have a Happy Anniversary Vicki and John. Your wedding looks like it was a blast and very memorable for all involved. Celebrations evolve and gifts get more practical as we have gone along but the important thing is my husband and I still love each other 40 some years on. Here's to a great and eventful life for you and John. 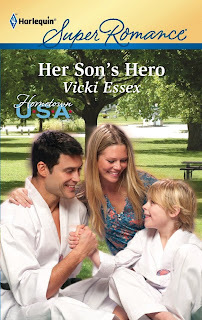 Congrats, Vicki.....thanks for sharing the post! It is so awesome. Happy Anniversary to the both of you. It makes me smile to see couples who are so inlove and especially who are together for almost a lifetime. It makes me believe in everlasting love. Stay inlove always. Thanks for sharing. It's very inspiring!